At Sunday’s 100th PGA Championship at Bellerive Country Club in St. Louis, record-breaking crowds cheered Tiger Woods’ surprise second-place finish and Brooks Koepka’s victory, the third major title for the 28-year-old. While golf is the antithesis of a speed sport, Omega has been the official timekeeper of the event since 2011. 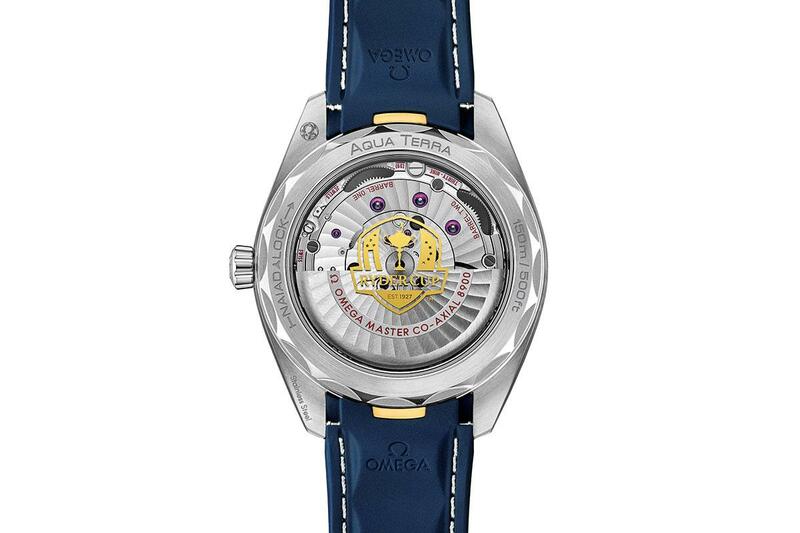 At this year’s match, Omega unveiled a Seamaster Aqua Terra Ryder Cup model ($5,950) in anticipation of September’s Ryder Cup competition in Paris. The new model is designed with a silvery opaline dial with horizontal stripes and touches of red. The Master Chronometer Calibre 8900 movement is on display through the sapphire crystal-case back, which is coated with a Ryder Cup logo in 24K gold. The piece comes on a blue rubber strap with an additional stainless-steel bracelet. The Master Chronometer Calibre 8900 movement is on display through the sapphire crystal-case back, which is coated with a Ryder Cup logo in 24K gold. 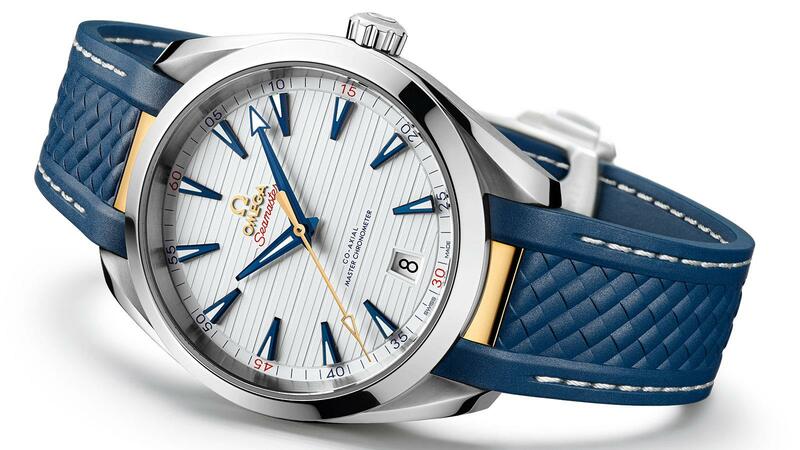 Last year, Omega introduced two Seamaster Aqua Terra Golf models ($5,400) dedicated to the brand’s golf ambassadors Sergio Garcia and Rory McIlroy. The 41mm stainless-steel watches feature dials with a horizontal pattern evoking teak boat decking in a choice of black with green accents (for Garcia) or white with orange accents (for McIlroy)—both with colorful, striped NATO fabric straps. In addition to its high-profile Olympic Games sponsorship, Omega has been partnering with golf events around the world for more than 30 years. The PGA Championship gave the brand “an opportunity to show our commitment to golf and our commitment to a worldwide major,” says Aeschlimann, who hosted VIP retailers and clients in a hospitality area overlooking the 10th fairway, where they could watch McIlroy and Tommy Fleetwood, Omega’s newest golf ambassador, shoot for the green. Also in attendance was Olympic champion swimmer Michael Phelps, another Omega partner and avid golf fan. 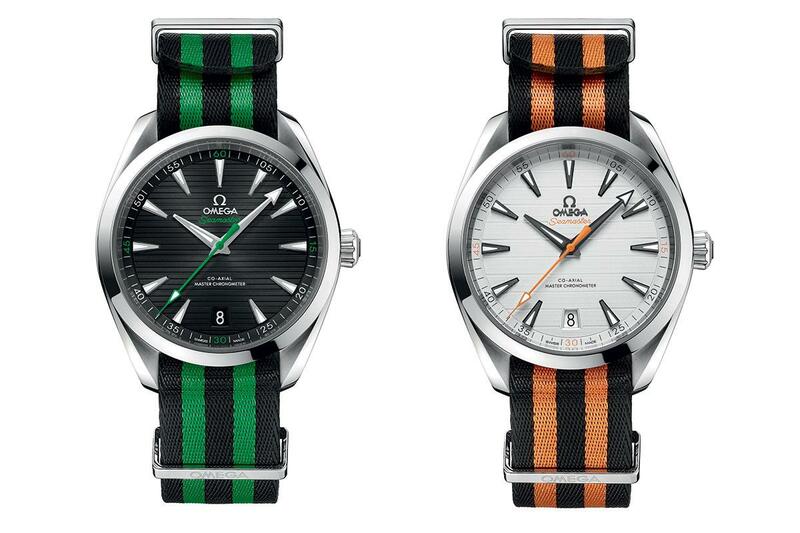 The Seamaster Aqua Terra Golf models, in black with green accents for Sergio Garcia, left, and white with orange accents for Rory McIlroy, right. At the biennial Ryder Cup, where top U.S. golfers face off against the best Europeans, Omega outfits the U.S. team and serves as official timekeeper when the event is played on American links. Aeschlimann particularly enjoys the Ryder Cup’s team competition and the passion that brings to the event.